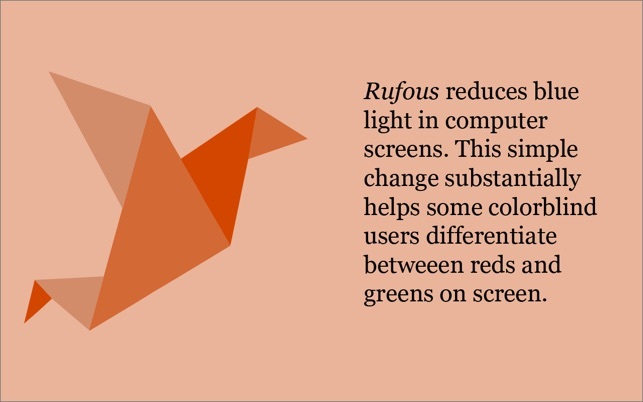 Rufous reduces the amount of blue light in your monitor. It was designed to help colorblind users differentiate colors more easily. Since installing this application a few weeks ago, my eyes noticeably feel SO much better from there being less blue light! A few times I went to temporarily disable this application to see how much blue light my screen normally had— the blue light was excessively harsh (Macbook Pro Retina)! I was surprised that there was that much blue light I was exposed to before knowing about this application. No wonder my eyes were strained and dried up. Definitely recommend this. The screen feels so much more gentle and “natural” on the eyes. I set this application to always open on start-up, so that way I don’t have to get as much blue light ever again. Great app so far. It reduces the harsh contrast of bright screens, and feels far more like I’m looking at a physical object than at a digital screen. I’ve noticed significat eye relief when viewing my screen using the app. Turn it off and you’ll be amazed at how glaring and harsh the screen is without the app. It is free and works! Does what it states, reduce blue light. Not extra functions, like scheduled timing, but who cares. You can just disable/enable when you need it. Thank you for this app! Love it!